GEM Overhauser base station in action. can be stored at one time. When working with magnetic data from any source – ground, air, and UAVs, it is essential to have a means of removing unwanted noise arising from solar and atmospheric activity. These effects can be quite significant and impose linear “drifts”that affect overall data quality. Use of a base station is important to remove the effects of daily magnetic drifts (diurnals) on the order of a few 10s of nT and micropulsations on the order of thousands of nT from the interaction of the solar wind with the earth’s magnetic field. GEM has a special expertise that it has incorporated into all of its base station offerings. The company has long been a standard for magnetic observatories conducting daily and long-term measurements. This experience has allowed GEM to design base stations that are stable, reliable and drift-free – giving the ultimate in accurate results. This experience gives GEM a position as a leading supplier of base station instruments for ground, airborne and UAV work. GEM manufactures two, leading solutions for base station applications. Choice of system is based on features but also on the ultimate resolution required. For routine or advanced requirements, a good choice is the Overhauser base station. This system has been upgraded with fast sampling (10 Hz), enhanced memory and noise-free sampling algorithms. Other features that make this a good choice are its high sensitivity (0.022 nT @ 1 Hz); low power consumption; and minimal long term drift of 1 part per million per year (from observatory experience). Another alternative is the optically pumped Potassium base magnetometer. This gives the ultimate in sensitivity for unmatched correction accuracy and gives very sensitive readings at 0.0003 nT . The key considerations in operating a GEM’s base station comprise location, setup, synchronization, operation and downloading; each of these steps is easy to accomplish. Guidelines typically call for location of base stations 100 m or more away from large ferromagnetic objects or active roads and highways. It is recommended to operate 200-500 m away from power lines where possible. 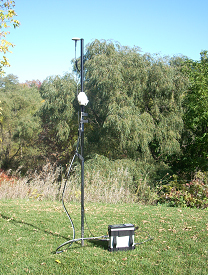 Some surveys call for base stations to be located a large distance from the survey site; a distance of 60 km or so is the largest distance to be of practical use. To assist in setting up surveys, GEM provides base stations with standard 10 m cable lengths; which is typically sufficient to locate the base station away from typical noise sources. Other lengths are optional. Survey set up is a fast process, requiring the selection of a location and then positioning the unit. The unit is weatherproof and tested in many climates around the world. Once the base station location is determined, the console and sensor times are established and the system is started. Using GPS time on both units (both units must be equipped with GPS). This method does not require any interfacing between units as GPS times are the same for each. Using rover GPS (only rover GPS equipped with GPS). The operator connects the two units together and sets the base station time to the current GPS time. Units are then disconnected for surveying. Use local time. The operator sets the local time on one unit and then connects the two units together for synchronization. Immediate Start. The operator sets this option and then a pre-designated start key. Starts recording automatically. Daily Start. The operator specifies a time at which the base station is to turn itself on during each day of surveying. This simplifies field work, so operator does not have to travel to the base station location each day. It is a time-saving capability. Start. The operator pre programs up to 30 start and end periods. This mode of operation has huge benefits for large surveys or when the base station is located some distance away. With each method, data is downloaded either by connecting a cable between rover and base units, and automatically performing drift corrections; or by downloading each of the rover and base data files and then performing corrections using GEM’s GEMLinkW software. GEM’s GEMLinkW software is an easy-to-use program that enables fast correction of rover files from base station data. Final data is marked with GPS or local time along with magnetic data. Data is then ready for import into industry standard software for processing and analysis. For more information on your next base station built to observatory standards by default, contact GEM.